When you think of states that are known for hockey, which ones come to mind? Go ahead, we’ll wait. Either way, the first state that came to mind probably wasn’t Florida. The Sunshine State is known for baseball and beaches, but not hockey. That didn’t seem to matter to Chase Priskie, the Pembroke Pines, Florida, native. Priskie grew up playing hockey in Florida as a kid, but when it came time to play in high school, he chose to take his talents up north. At the age of 15, he packed his bags and headed to South Kent School in Connecticut. He made stops in North Dakota and British Columbia, before returning to Connecticut to join the Bobcats. It was with South Kent, however, that Priskie got his first taste of what it’s like to be a member of the Quinnipiac hockey team. Priskie and his team were on campus, taking a tour of Quinnipiac’s hockey facilities, when the coach pulled him aside. Rand Pecknold wanted to see him in his office. Surprisingly, it wasn’t a prank. 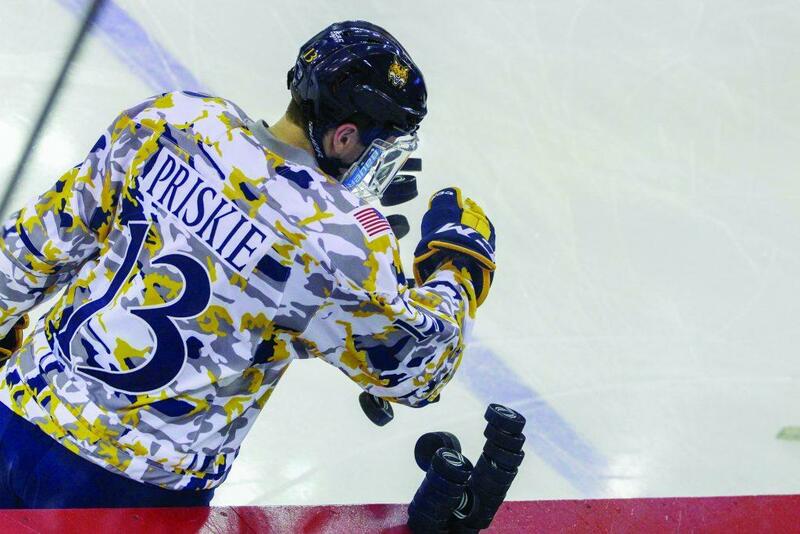 Priskie committed to Quinnipiac, and was slated to join the team for the 2015-16 season. Little did he know, he was joining a team that was poised for a run to the Frozen Four. Not only did Priskie stay in the lineup, but he finished seventh on the team in points. The players ahead of him that year? Five of the six are current professional hockey players, and two of them have played in the NHL. Not bad company for your first season. Being a student of the game, Priskie took the opportunity to learn from those players. Not just how to play the game on the ice, but how to conduct yourself off of it. “I was very fortunate to work with guys like Devon Toews, Connor Clifton and Derek Smith, who, whether I liked it or not, always had something to say and something for me to improve at,” Priskie said. One of the things that his coaches and teammates instilled in Priskie from a young age was the importance of playing a more defensive style of hockey. Known as an offensive defenseman coming into Hamden, Priskie quickly learned that the best players in college hockey know how to play in all three zones of the ice. Fast forward three years and he’s in his second season as the captain, the 45th in the program’s history. Not only that, but he’s in the running for the 2019 Hobey Baker Award, given to the best player in college hockey. Despite all of the attention and accolades, however, Priskie isn’t satisfied just yet. Since Priskie was nominated back in January, the Bobcat community has taken to Twitter to spread the #ChaseTheHobey campaign. The goal is simple: get as many people to vote for Chase each day as possible. Always humble, Priskie appreciates the support but tries not to let it distract him from playing the game. His coach, on the other hand, thinks differently. Chase’s mother, Lisa Evans, echoed what Riga had to say. Although she’s more than five hours away by plane, she has had a front row seat to all of the attention her son has been getting. A former hockey player herself for the Bowdoin College Polar Bears, Evans knows the game inside and out. She’s watched her son grow over his three years in Hamden, from a freshman just trying to stay in the lineup, to one of the best defensemen in the country. No one has seen this leadership better than Riga. Riga echoes that Priskie has proven himself to be just as valuable off the ice as he is on it. Priskie’s leadership ability was put to the test in his first season with the “C”. The 2017-18 season was a trying year for the Bobcats, who finished under .500 for the first time since 1995-96. Some players would be quick to forget a season like that. That’s not how Chase Priskie operates. Choosing to return to Hamden for his senior year, Priskie forewent signing a professional contract with the Washington Capitals, the team that drafted him back in 2016. He knew he had unfinished business with the Bobcats in 2018-19. So what exactly is the mindset of a player like Chase Priskie? The way he puts it, it’s actually a pretty simple formula –believing that you’re better than your opponent isn’t good enough. You have to prove it, day-in and day-out. Not a bad way to think. And now, this approach has helped him land a top 10 spot for the Hobey Baker. Those around him share a similar sense of pride and joy seeing him recognized for the work he’s put in. There’s plenty of reasons for her to be proud. Priskie is near or at the top of the list for the most points and goals scored by defensemen in the nation this year. Whether it’s a power play, a penalty kill or five-on-five play, he’s always the first one off the bench for Rand Pecknold.